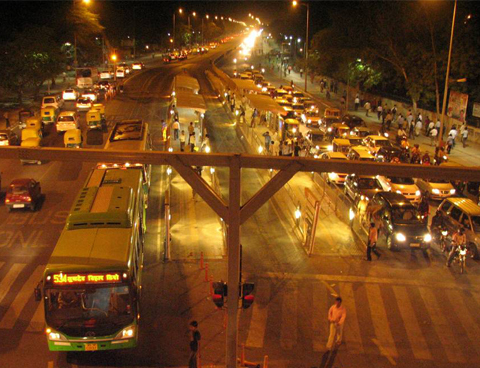 The experimental Bus Rapid Transit (BRT) system in Delhi, which reserves a portion of the road space to facilitate fast movement of high capacity buses and prioritises public transport over private, has been facing a barrage of vitriolic media criticism ever since its inception. But before we apply permanent brakes — under political and media pressure — on a system which has succeeded in several big cities across the world, we need to pause, reflect and learn the appropriate lessons. Cars occupy 75 per cent of road space but are used by less than 15 per cent of the populace even in the most affluent Indian cities. In contrast, buses occupy a mere 8 per cent of the road area but are used by almost 20 to 60 per cent of the people. Pedestrians and cyclists constitute an overwhelming 40 to 75 per cent of commuters but are completely marginalised in our planning system as a major part of budget allocations is consumed for road widening or flyover building, which primarily benefit cars and two wheelers. Pedestrians, who should normally have first claim on the road in any mature city, have become the missing dimension in our transportation policy. Be it the BRT or any of the newly opened flyovers which criss-cross our cities today, the case is the same: Desperate women trying to jump over the medians or old men running through the maze of traffic to cross the road are sights common enough in India. To become successful, the BRT or any other transit system needs to grow beyond mere traffic engineering. Socio-cultural parameters need to be built in, right from the conceptualisation stage. The issues of equity and social justice in the urban physical realm are seldom explored. We need to make our urban transportation policies more inclusive, equitable and sustainable. But the crux of the challenge lies in co-ordinated policy implementation. Failing this, the future of mobility in urban India will forever remain stuck in a jam.